The freshman will compete for a final roster spot in junior hockey's most important international tournament, hosted this year in Vancouver and Victoria, B.C. Crimson freshman Jack Drury has earned a spot at team USA's World Junior Championship camp, where he will vie for a final tournament roster spot. Harvard men’s hockey freshman Jack Drury has been named to the United States’ preliminary camp roster for the 2019 IIHF World Junior Championship, per USA Hockey’s official announcement on Wednesday evening. 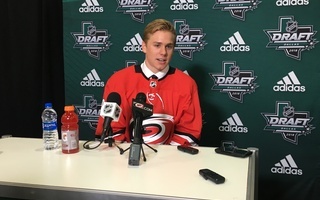 The 18-year-old is one of 29 Americans who will contend for a final roster spot for the tournament, taking place in Vancouver and Victoria, B.C., from Dec. 26, 2018 to Jan. 5, 2019. Drury, a center for the Crimson, will need to beat out several of the 16 forward invites to secure a chance to represent the stars and stripes this winter. The Winnetka, Ill., native will attempt to do so at the team’s camp, which lasts from Dec. 15 to Dec. 20 and splits time between Everett, Wash., and Kamloops, B.C. A Harvard skater has donned the red, white, and blue in the past three World Junior Championships. 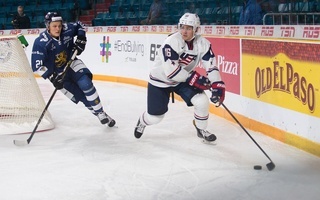 Former standout Ryan Donato skated to a bronze medal in 2016; current junior Adam Fox earned gold in 2017 and bronze in 2018 as an alternate captain on the blue line for team USA. 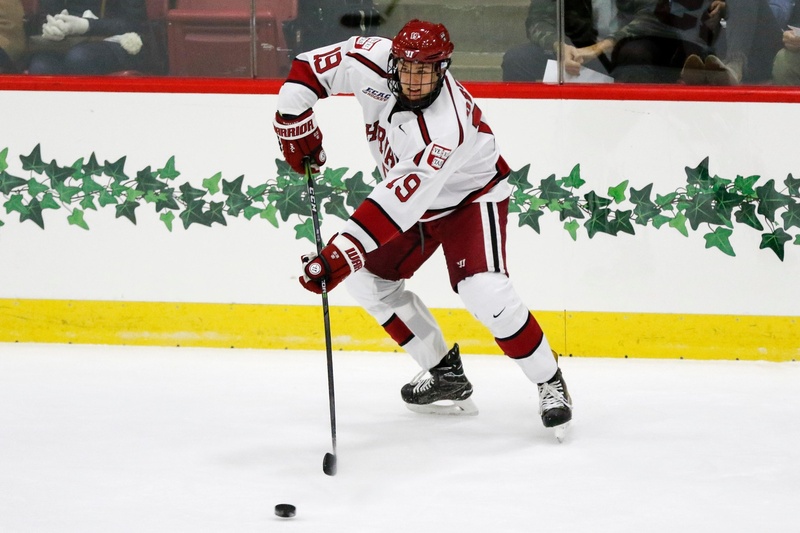 Drury hopes to continue his collegiate program’s recent streak of WJC performers. The World Junior Championship is the grandest stage for junior hockey players worldwide. In the past three years, numerous alumni of the USA team have graduated to stardom in the National Hockey League, including Auston Matthews, Jack Eichel, and Zach Werenski. This year’s American squad, featuring seven NHL first-round draft choices and the presumed No. 1 pick in the 2019 draft, Jack Hughes, promises to contend for gold. Drury is well aware of the unique opportunity in front of him. Drury’s uncle, Chris, skated for the Americans in the 1996 World Junior Championship before a successful NHL career featuring a Stanley Cup victory and three Olympic appearances. His father, Ted ’93, also has history with USA Hockey, playing in two World Junior Championships — captaining the squad in his second year — and competing in two Olympic Games. In this year’s iteration of the tournament, the United States will play in Group B along with Slovakia, Kazakhstan, Sweden, and Finland. In 2018, the Swedes knocked off team USA in the semifinals before falling to Canada in the championship game. 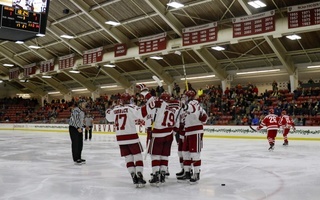 Drury hopes to ride his success through 11 NCAA games this season (4–8—12), in which he has pivoted the Crimson’s most effective forward trio, to a prominent role in the 2019 tournament roster as it looks to medal for a fourth consecutive year. The forward ranks third in the nation in points per game (1.09) among freshmen and thus far has answered any outside concerns about a young attacking unit replacing lost scoring from last season. If Drury does earn a final spot in the forward ranks, he will begin tournament action against Slovakia (Dec. 26, 6:30 p.m. EST). The Americans then take on Kazakhstan (Dec. 28, 10:30 p.m.), Sweden (Dec. 29, 10:30 p.m.), and Finland (Dec. 31, 10:30 p.m.) to conclude the group stage before knockout play begins on Jan. 2. For now, Jack Drury is one step closer to being a part of the Americans’ quest for gold on junior hockey’s premier international stage. Thursday June 2. *MORNING PRAYERS. Rev. Samuel Smith Drury. Appleton Chapel, 8.45 A. M.